I decided to bring this topic alive over here in Hercules. I've gathered a few different other links that I found to be interesting and removed some that were dead and no longer had any use. Hopefully I'll be able to keep this topic as updated as I possibly can, of course with everyone's help! StarGames Old CP, very gold! Yes yes, I loved that CP, liked because it was simple and had everything in it. @mysterious, the sgcp work for hercules right ? It should. I haven't tested it with Hercules though. *Edited topic : added some new things! I wanted to use it on an emulator without 3rd, where I make the change? Or, use Hercules or rAthena and just turn off "Third Job" settings. Please include Ragnarok Online 10-18-2013 kRO Client Folder torrent download and help seeding.. Moved to General Server Support; there's a lot more here than client-side tools. ..For the record: RMS (WWW.RateMyServer.NET) won't support Torrent, some users already asked for it (including myself) they say, since it's not their files and SEEDING will be a problem, they wont supply a torrent file for it, therefor DO NOT BLAME THEM FOR THIS TORRENT (RMS WWW.RateMyServer.net IS NOT RESPONSIBLE FOR THIS TORRENT).. ..This kRO CLient Folder is dated as 10-18-2013 (mm-dd-yyyy), therefor BEFORE YOU DOWNLOAD THIS, you should check if there are any changes - you can check it in here http://ratemyserver.net/index.php?page=download_kROLinks check the file date..
Added: Ragnarok Online 10-18-2013 kRO Client Folder. Removed Miruku link as it is dead. Also added Neo's NEMO Client Patcher. 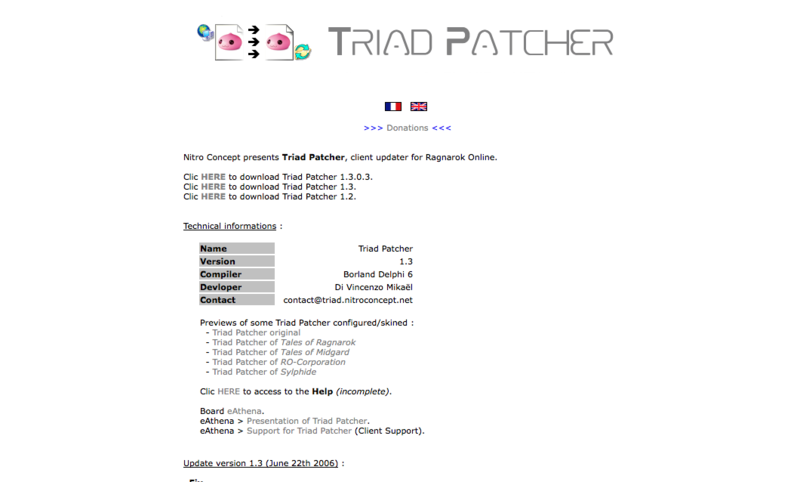 I just tried the Triad patcher link and I got problems loading page. I think maybe it is a broken link. ^ Sorry but InternalGuard is not free anymore, and it doesnt have any approved Paid Advertisement in our Forum thats why I removed your link. I tought Harmony didn't too.... Anyway, that was just a suggestion. isn't it free if used in localhost? I don't think so... o_O Their new update requires a paid key of some sort.. from what I've gathered?